Battle of the Food Boxes!! So recently the boyfriend and I have been trying the ready to make meal boxes!! So before I get into each box individually I wanted to preface by saying some of the similarities of the boxes. 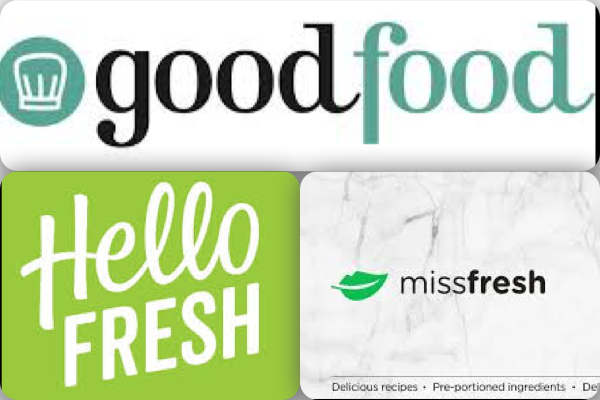 We have tried Hello Fresh, GoodFood and MissFresh. They all come in similar cardboard outside, insulated inside boxes. 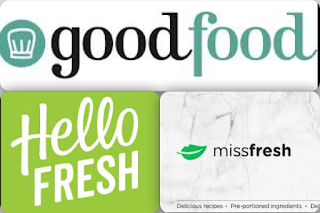 Super good packaging and the food was cool and was packaged in their recipes for easy put away and organization. We got three meals out of each week so that was nice. Not as much grocery shopping, and not a lot of thinking involved for weekend meals. We used coupon codes or first try codes for each box so they were way cheaper than normal. So our first box was Hello Fresh. Super popular and well known. I paid $32.00 for my first box with the discount and we got 3 meals with this box. This is how the food came. All neatly packaged and labeled which really helped when prepped. Produce was super fresh and not banged up which was also nice. This was our first meal. Super yummy, filling and light. Courtney, my boyfriend, couldn't stop raving about this one for weeks to come. Was a nice light meal. This was our third and last Hello Fresh meal from this box. Courtney really liked the relish and added it to his mental recipe repetoire. The lamb was good, the relish was a smidge spicy but that may have been because Courtney used red chili flavored olive oil to cook it in ;). I paid $29.00 for this box of 3 meals with a coupon code. So again this is how our food came in the bag. All well organized and labeled. The produce was a tad less fresh looking than Hello Fresh but nothing too crazy. This was our first GoodFood meal. It was super yummy and light but felt like a cheat meal because of the yummy Soba noodles!! I had a lot of cucumber on mine because Courtney doesn't like it, but I wasn't complaining! Our second meal. So I'm a sucker for anything pasta so of course I loved this dish. The lamb was super yummy in meatball form as well. The one thing I would ding it on was that the marinated feta had a lot of lemon in it so that kind of overtook the dish. This was our third meal. So this one was interesting. The barley risotto was crunchy, but still creamy and yummy. The salad seemed super lemony with the dressing on it. It felt kind of weird eating a meal with no meat but we tried it and I (as an avid meat lover) didn't hate it. So because we were using codes, Courtney decided to order a box as well. So we got two weeks of GoodFood boxes!! We are a Banh Mi loving household so this one had to be on the menu!! It was super yummy, easy to prepare and just plain tasty. The marinated veggies were kind of intense but we didn't put much on our sandwich and one of the carrots was kind of limp so we replaced it with one from our own kitchen. This one was super yummy and light. It was refreshing with the pico and the tomatillo sauce. One of the things I like about these boxes is that they let you try a lot of different things you normally wouldn't buy, like tomatillos. The meatballs were yummy and this one was yummy. Nothing beats steak and potatoes. This meal was a classic and was super yummy. Again my friend lemon reared it's head but by this point Courtney knew to limit the amount on my food because I was bringing it up so much (sorry babe!). The steak was yummy and a good meal to end on! So I'm going to be honest and didn't have a lot of faith in this one. I had read some negative reviews online after Courtney ordered this one but tried to remain optimistic. We got our box tonight and tried our first meal. I'll update this post as we try more meals. Courtney paid $30 for this box. As you can see there was less ingredients with this box. But they were all relatively fresh. As you can't see they were missing a Souvlaki seasoning pack for our chicken so we had to use our own spices which kind of took away from the souvlaki meal we were having. But I digress. So as you read above I love a good pasta so this was comfort food for me. It was super simple but also super yummy. Cheese, bacon and cream...you can't go wrong. So other than the missing spice packet this was super yummy. Can't wait to see what's next!! Guess who is actually alive?? These random breaks in blogging are becoming longer and longer. Life is taking over! With wrapping up my fourth year of teaching, moving in with the love of my life and being exhausted because...well...you saw the first few words of this sentence, blogging has definitely taken a huge back seat. It's almost summer break and I feel like I'm going to have some time to blog...and film some YouTube videos...which I have really started missing as it is a great creative outlet for me!! So just wanted to pop in and let you know that I'm going to be posting more starting now lol. Also, please forgive me if I pop off every now and then...life is busy!! Song I'm loving...Chun Li - Nicki Minaj. So I'm going to switch topics for a minute here. And I don't say that jokingly because of my crazy days with kids. I have diagnosed high blood pressure that I take medication for. I have for about 5 years now. It's part genetics, part diet, part weight. I kept getting tired of them just saying that it was my weight when I knew people heavier than me didn't have that problem, and I know of cases of people who are lighter than me do as well. So even though I don't think my weight is 100% to blame, it's definitely something I want to work on. I tried different meal plans but I never connected with them because they weren't focused on my high blood pressure issue. That is until I found the DASH diet. DASH stands for Dietary Approach to Stop Hypertension. I'm 3 days in, and even though I've had a couple slip ups, I'm good for most of the day and I'm finding it easy to do! Heck I've lost 3 pounds since Monday ;). It has 2 phases. 1st phase you cut out fruit and grains. 2nd phase you add them back in but with whole grain options only. Not a huge fan of white bread as is, thank goodness. So I just wanted to let you guys know what I've been up to in terms of eating. I'm liking the ease of it and how consistent I've been even though it's only been two days. Hope to keep you updated in future posts! So hopefully none of you betting folks thought I would keep up with a post a day because you'd have either lost or won big ;). Not exactly sure what caused my hiatus but it feels like one day turned to two and then suddenly it's been almost two weeks since I've posted. I blame getting back to school but then having snow days for hindering my inspiration lol. Anywho!! I'm back..for now..lol if you know me or this blog at all you know I'm always on the go. So sometimes it's challenging to find time to sit down and just write. But I wanted to get back to it tonight. I'm going to start by saying: be nice to people. I know that that is super simple advice but just do it. It's not hard and people appreciate it. Heck, if my fourth graders know that, then you should too!! Unless you are in third grade and haven't learned it yet ;). Also, don't be afraid to reach out to people when you feel lonely or sad, they will help rather than criticize you...if they are nice (if they are not, see above ;)). Like I had posted already this year: you are not alone. It's amazing what swallowing your pride and telling a truth or two will do for your mental health. People need to know that you are anxious, or lonely or depressed. Talk about it. Be ok with being truthful about it. You got this! I'm here for you. Even if you just stumbled upon this blog or are an avid reader. I'm here for you. I've pretty much been in most situations so I have advice and plus I'm almost 30..so..yeah that has to count for something right? My car wouldn’t start cold. Make sure your plugin actually works and isn’t glitchy. Have an awesome friend who will pick you up and drive all over town for you looking for a battery charger. Like to drive to warm your vehicle. Ok, so super random post, but I've got semi blogger's block so here goes.. I swear in the last two days I've had instances where things have semi creeped me out. Yesterday at lunch a coworker was talking about silicon cleaner things at the table and then I went upstairs and was scrolling through Instagram like an hour later and an ad I'd never seen before is in my feed. It freaked me out so I showed another coworker who was there too!! So I went 'home' last week and found a cassette tape of Big Shiney Tunes 7 and rekindled my love of 'LoverCall' on there. Now I'm out tonight at my local Boston Pizza and what song do I hear playing on the speakers?? Totally tripped me out and I couldn't believe it at first! Has anything like this ever happened to you? ?